The Lady Bulldog softball team strengthened their hold on the top seed in District 4-AAAAA Tuesday at the Mack Chase Athletic Complex, improving to 15-4 on the year, 6-0 in D4 play, with a sweep of the Lovington Lady Wildcats. Lovington used a rare Lady ‘Dog defense miscue to jump out to a 1-0 lead in the top of the first of Tuesday’s opener, but Artesia was able to right the ship in the bottom of the second. There, Aubree Olguin doubled to lead off, and Gabrielle Gomez and Nikki Reyes – both aboard with walks – joined her in crossing the plate on a big three-RBI triple by Alexa Riggs. A two-run homer by pitcher Kacey Thurman followed to make it 5-1. A sixth Lady ‘Dog run came around in the third on a Gomez double, and Artesia made it 7-1 in the sixth on a Thurman sac-fly. The Lady Wildcats were able to get one more on the board in the top of the seventh, courtesy of a base hit by pitcher Addison Marquez, but that would be it, as Thurman struck out two in the inning and popped the third out up to catcher Melody Payne. The Artesia junior finished with three hits, one earned run, and seven Ks through her seven innings of work, while Riggs and Olguin both went 2-3 at the plate – the former with a triple and three RBI and the latter with a double – and Gomez was 1-1 with a double and one run batted in. The Lady Bulldogs got off to a quicker start in the nightcap, plating two in the first on back-to-back doubles by pitcher Kali Crandall and Adrianna Baeza. Lovington cut their deficit in half in the top of four, 2-1, on a Danika Utajara double, but Artesia regained some breathing room in the home half on a Stacia Martinez single, then effectively put the game on ice in the fifth. Elisa Cardenas led off that at-bat with a base-hit-turned-error to left and scored on a subsequent single by Crandall. Crandall and Olguin – on with a double – crossed on another two-bagger to the left-center-field fence by Payne. RBI doubles by Gomez and Cardenas, and another Martinez base hit closed out the inning, 9-1, as the Lady ‘Dogs batted around. Two quick outs in the bottom of the sixth appeared to squash Artesia’s chance at a run rule, but Gomez put that back on the table with one swing, launching a walk-off, two-run homer to end the evening, 11-1. Crandall finished with three hits, one earned run, and nine strikeouts in her six innings of work. At the plate, she and Payne both went 3-4 with a double and two RBI, and Cardenas and Martinez were 2-3, the former with a double and one RBI and the latter with two runs batted in. 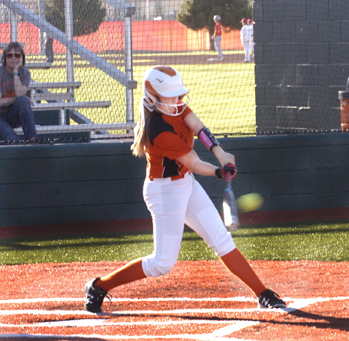 Artesia will enter Round Two of district play Friday when they had to Roswell to take on the Lady Coyotes. Having swept Goddard Tuesday, the girls in red will no doubt be looking to avenge at least part of a 6-5 (eight innings) and 13-1 (five innings) sweep at the hands of the Lady Bulldogs April 11 at The Mack. Game times are set for 5 and 7 p.m. at Roswell High.